Yesterday I had a play day with my daughter. We did some rearranging in her home (which is very large). She wanted to redo her living room, familyroom and dining. We had so much fun rearranging her wall art and accessories. She had also seen a fabulous screen that she loved and was thinking about getting it and hanging it on the wall. Loved it and so we bought it and it is stunning. No, I didn't get pics, but I will when it is hung and show you the whole room. Gorgeous. This is where my furniture problem came in. 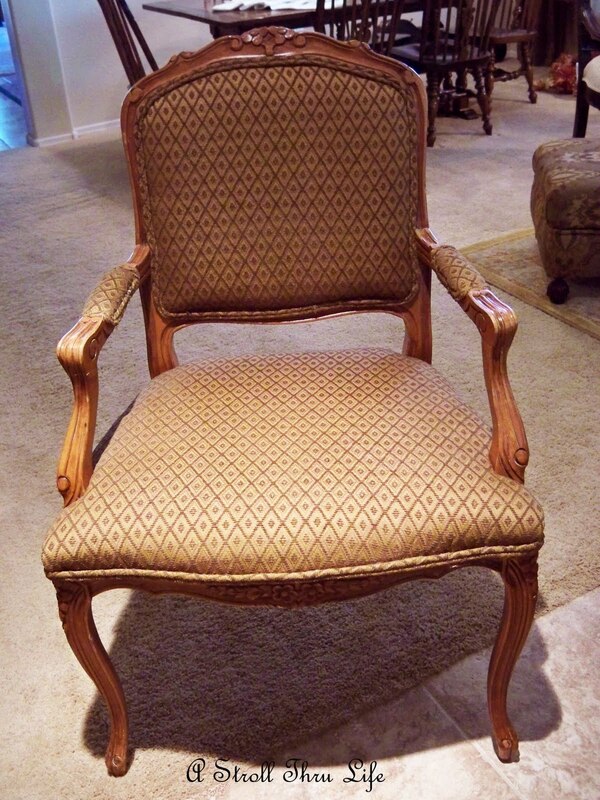 I have been wanting a Bergere chair for ages. She went to help me pick out fabric. 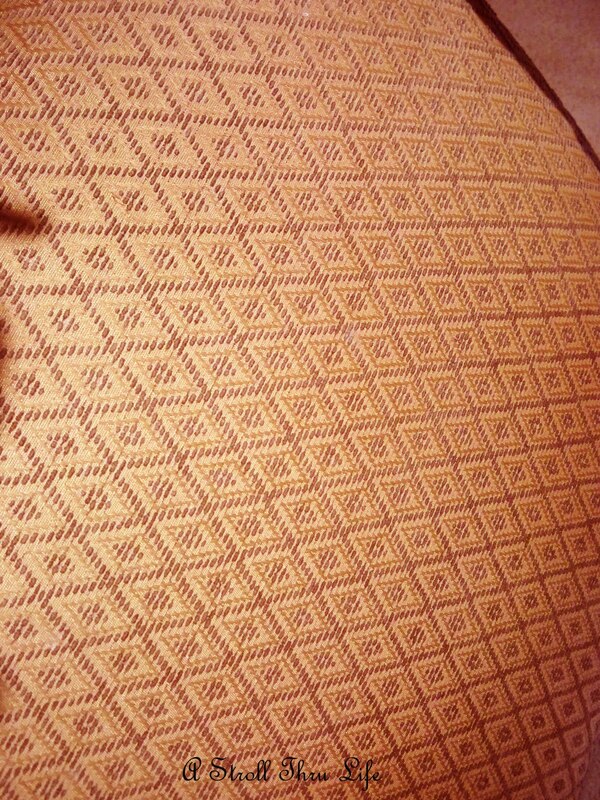 Now Bergere chairs are LARGE. As she reminded me, my house is SMALL. So we started looking at Louie chairs, they have the similar feel, only much smaller. So now I had to rethink my decision. That led me to this. Her screen that we bought was at a Hotel Furniture Liquidation place. Fabulous furniture and at unreal prices. This wonderful chair was $79. 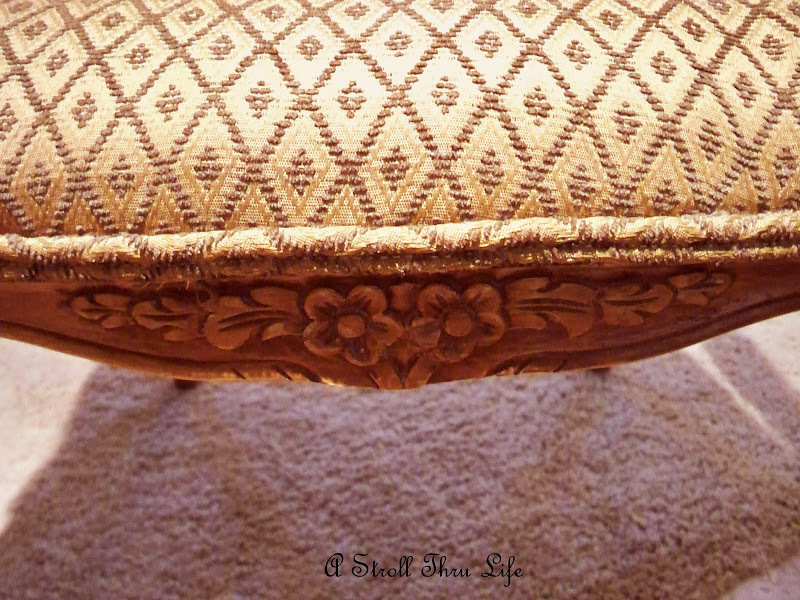 Great detail, carving and the fabric even works, plus if I decide to recover it, I can even do it myself. The Bergere chair I was looking at was over $700. So into the car went the chair and I saved a ton, plus it will fit my small house so much better. Love the fabric. It is a rusty orange and gold. Pretty design. The wood is actually much darker than it shows in the pics. The carving detail is very pretty. Great lesson to always remember the scale of the room and your furniture pieces. I am still storing furniture for my son who will be moving soon (or at least he hopes so), hence my house is FULL. DH wanted to know when I brought the chair home if I was planning on hanging it from the ceiling? Men!!! For now it has a home next to the china cabinet. Works for me. This. For $49. it came home too. Love the base, hate the shade, so now onto the hunt for the perfect one. 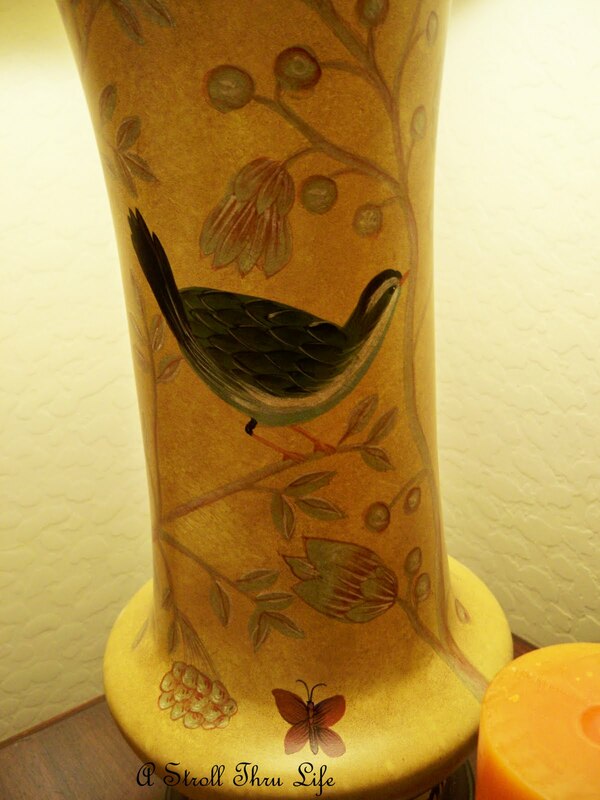 So pretty with the birds, flowers and butterflies in the softest shade of mustard yellow. It is hand painted and all of the ones they had were a little different. This was my favorite. I am linking to Met. Monday hosted by the gracious Susan @ Between Naps On The Porch. Be sure to pay her a visit to see what everyone has been up to. Hi Marty, I love the chair and especially love the lamp...the birds are beautiful. I really enjoy your blog...take care. I love your chair. . . and the price is so wonderful! ! ! 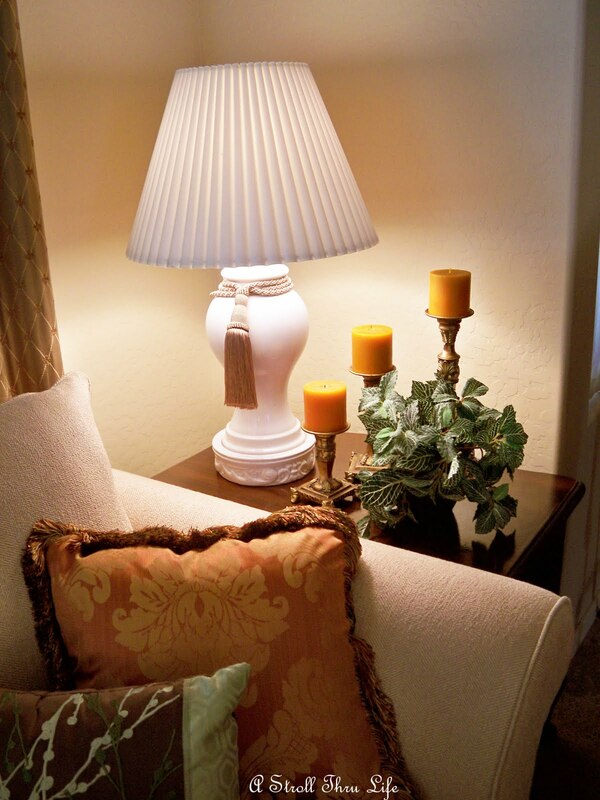 The detailing on the lamp is an interesting design and works so well with the remaining decor in your home. Have you ever tea-dyed a lamp shade? ? ? I did some white ones years ago, they took on a lovely amber hue when lit and an off-white (ecru shade) when off! I'll be waiting to see your next adventure and pictures of your daughter's home, as well. That chair and that lamp are gorgeous. Very nice additions. I love the chair, I love the lamp, and it all fits so beautifully with your decor! Great deals too! You go girl, you always inspire me! Hello Marty, You found a GREAT little chair, such nice features. And your lamp looks so nice on the side table. Both are perfect additions to the room! Amazing prices Marty!! Love the chair, but the lamp is my favorite-gorgeous! What a great chair! I would have loved to have been there shopping with you ladies. Your lamp is gorgeous, too! Nice finds!!! Pretty changes Marty. I love the lamp and the chair! I love the chair and the lamp, they both look great in your home. I'm not sure that you need to do anything to that lovely chair, except enjoy it. Oh, Marty! Beauty abounds!! I love your pretty chair and what a bargain! Your new lamp is so pretty too! What a lucky find! You always have the most beautiful things and I just love coming by to see what you're up to. Both chair and lamp is so lovely. I know both look so pretty in your pretty home.. Thanks for the tip on making my own comforter...if I find two pretty sheets, I may do that. Marty, great chair and love the lamp base. Men say the darndest things!! As we say around here, "You done good." Love the chair, and the birds on the lamp are great. Such wonderful finds!!! I love the chair and the lamp! Marty, it sounds like you and your daughter had so much fun! I love, love, LOVE your new chair! It looks as though it was made for your home...very pretty! And...your new lamp is gorgeous! It's one that I would have picked as well...love that sweet little bird! It really looks pretty with autumn just around the corner! So happy for you, dear friend! Hope you and your sweet family are having a wonderful and safe holiday weekend! What a steal on the chair, it's wonderful. Your new lamp is so pretty. wow marty, what a beautiful chair and it looks perfect in your home. Love those bird lamps too.~! LOVE LOVE LOVE That lamp base! What great finds! I need to check and see if we have one of those Hotel Liquidators near us! I really like your new chair and lamp! They are very pretty and great prices! Thank you so much for your sweet comment on the "Autumn of my life" post! I really appreciate what you said, it means a lot to me! love the chair AND the lamp...woo-hoo for you! I swear you are the only other person I know that loves orange! have a good weekend! Love the chair. The fabric is gorgeous. And for that price you could by two of them (and then have to build an addition to your house). Finally a few minutes for catch up...love the new chair, DH's comments gave me a real giggle, that's the sort of thing my hubby would say...aren't they sweet? LOL!! I agree about the shade, it doesn't do the base justice. Thanks for popping by and leaving me lovely comments about my bears...a little praise goes a long way thesedays...you are a dear friend Marty. I love these French chairs! Can't wait to see what lampshade you choose. You're always so great to visit and comment. Makes my day! I love the chair and the lamp! What great deals! 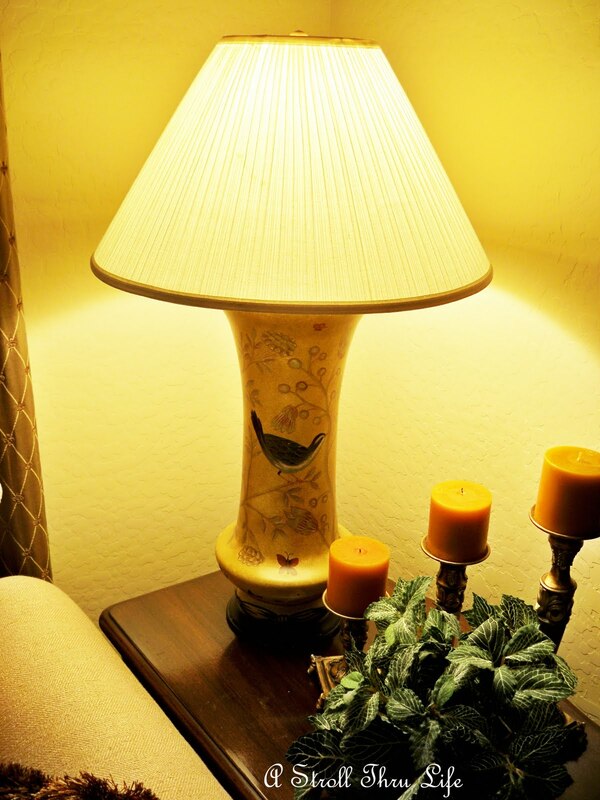 The bird on the lamp is darling, I love the colors...very nice on your table with the candles. Thanks for sharing. Looking forward to pictures of your Mommy n Me play day! Beautiful.. love the way the colors are coordinated of the candles and the lamp.. very pretty chair too!! Gorgeous lamp, Marty! I love that base! 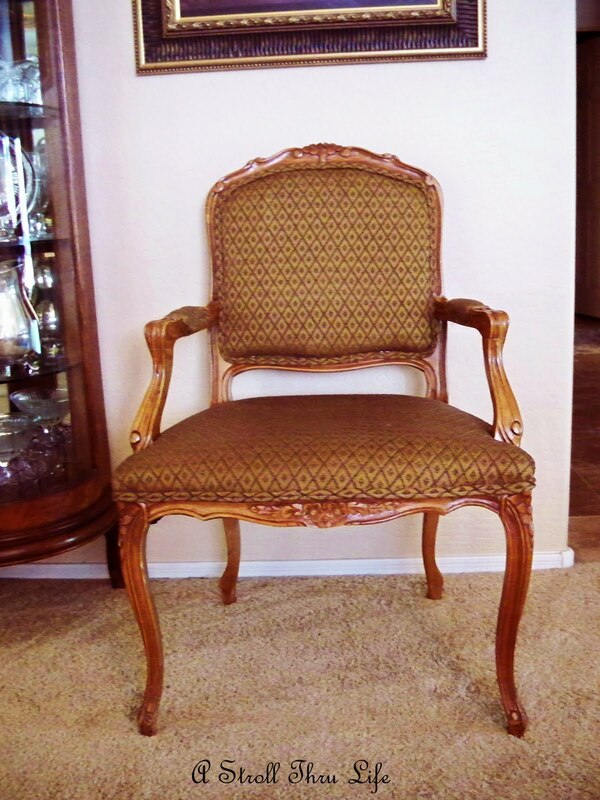 How funny, my Mom was just talking about how she'd like to get a Bergere Chair and she even had a picture to show me of the one she fell in love with. I think the one you got is great and you could always re-upholster and even add a cushion seat if you decided to make a small version of one. LOVE that chair! Beautiful! And that lamp base is gorg! I have been wanting a couple of chairs like that! Both the chair and gorgeous lamps are fabulous finds! Congrats. Looks like you had a great time with your daughter! You made the right call on the Louis chair--perfect proportions! And that bird lamp is darling. What fun! Gorgeous chair! 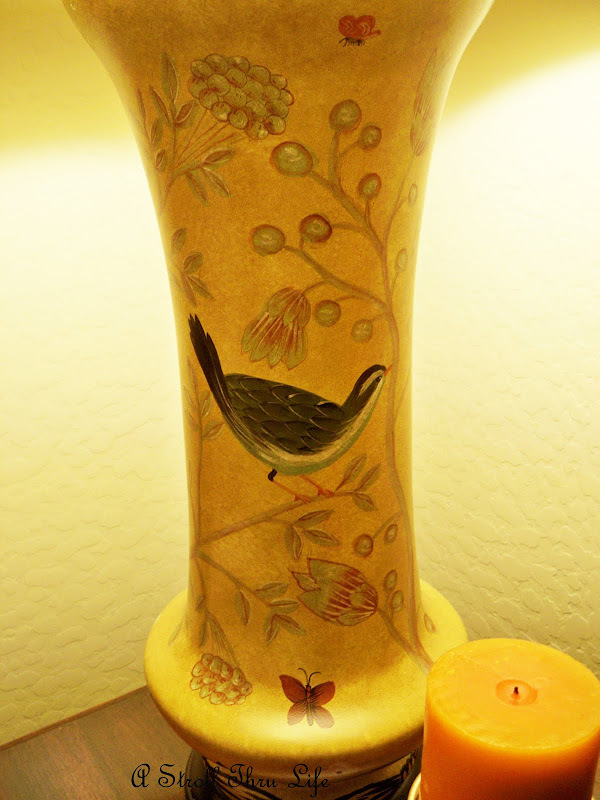 And I love that lamp, I think I'm going to steal the bird design for a plaque I'm painting for a friend, too cute! I love that chair, Marty. It is truly lovely. I just adore Furniture Liquidators! Those lamps are a sweet tweet to be sure. Lucky girl! Both the chair and lamp are terrific. You did so well. Glad to stop by -- we need to come to one of your parties very soon. (Jane's been doing rugs on Tues but we have to get a rug on table to post). Jane F.
I do love that chair and new lamp. I love, love, love the chair! What a wonderful price! Sounds like you and your daughter had a splendid day. Can't wit to see te rest..
First, LOVE that chair! I would like not just one of them but a pair. I agree about scale, too. That was a problem that we had when moving from our first house (small) into the one we are in. All of my rooms are realllly big. (I think that when I'm vacuuming...) My furniture was on the small scale for the small house. Filling it up with yet MORE small pieces looked stupid. I needed larger pieces. Loving the chair Marty! 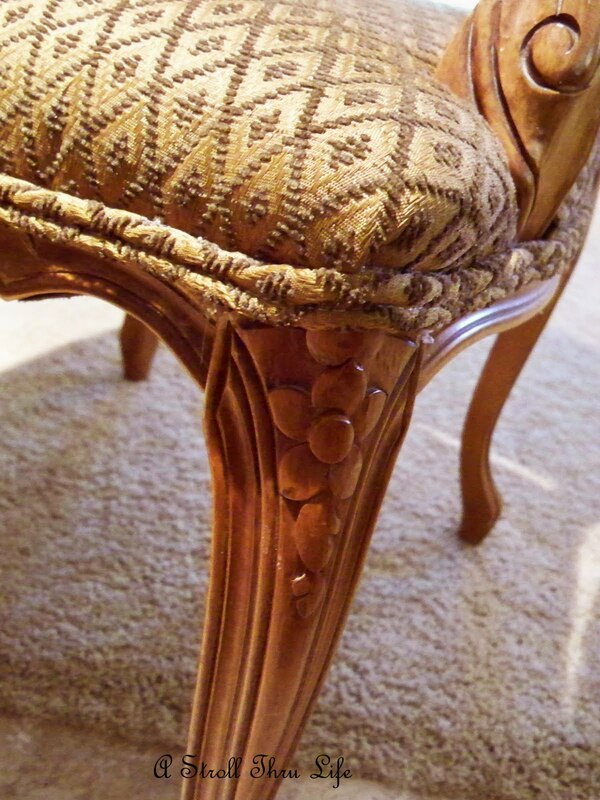 I have a pair of frenchy chairs with very similar carvings. That chair is SWEET! What a great find. Love the new lamp, too. I'll bet you and your daughter had fun rearranging and shopping together. I always love doing that same thing with Mom. 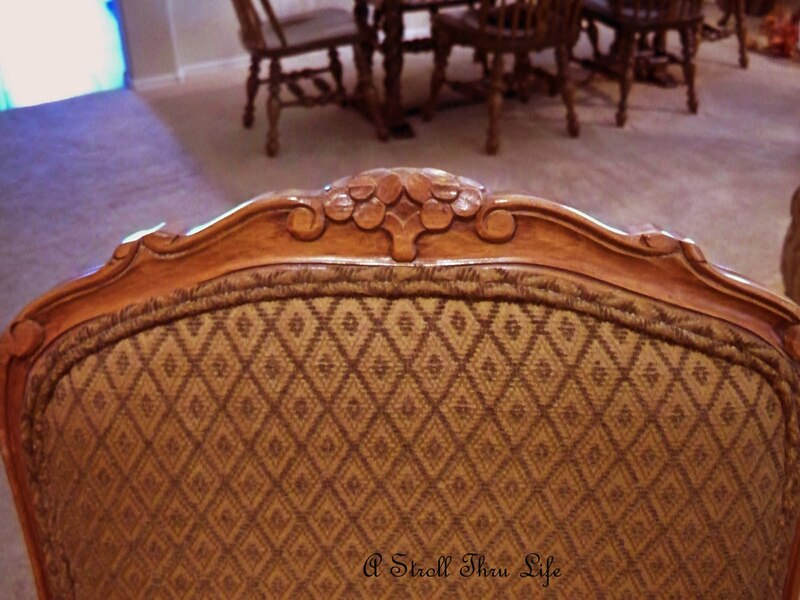 Your new chair is perfect - you are so right about scale. Good luck finding just the shade for the lamp. You have a very beautiful furniture. Love the chair too.